This Walküre was staged at Salzburg in 2017, but harks back to an earlier era. That year marked the 50th anniversary of the Salzburg Easter Festival, and to commemorate the occasion, the first production in the event’s history was re-created. So what we have is the Karajan/Schneider-Siemssen with some slight adjustments for modern times by director Vera Nemirova. The sets are essentially those of 1967, with the glass screen backstage effects now achieved though computer projections. The costumes have changed though (the new designs by Jens Kilian), with the strictly abstract, neo-Bayreuth style of the original replaced by what seems to be 60s mufti. So, for example, Vitalij Kowaljow wears a huge fur coat as Wotan, but beneath is a 1960s business suit. 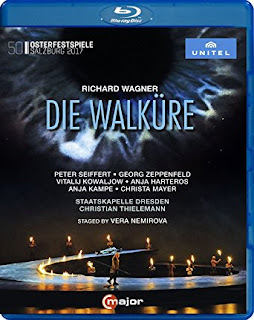 Given the highly acrimonious state of aesthetic politics when it comes to opera staging these days, especially in Wagner, the whole project seems dubiously regressive, and if the 60s additions are designed to bridge the gap, they are a token gesture at best. For act I, Hunding’s house is formed by the roots of the ash tree, an impressive and imposing piece of stagecraft dominating the Festspielhaus stage. Acts II and III have a more abstract setting, a ring set on the stage and broken at the back with one arm raised—so that’s the mountain peak on which Brünnhilde (Anja Kampe) is exiled at the end. The glass paintings-turned-computer projection backdrops consist of a lot of smoke effects in the first act, and later on a huge eye looking down on proceedings. Beyond that, the physical props are minimal. The valkyries have impressive feather-crested helmets, but ride hobby horses. Fricka (Christa Mayer) is flanked by two rams—men with ram skull helmets—but her chariot is a beige easy chair that they carry on for her. Once that has gone, there is very little on the stage for the remainder of the opera. The Magic Fire follows the inner rim of the ring on the stage, which isn’t very impressive, but is supplemented by a torchlit procession of fallen soldiers over the final bars. The musical side is more impressive, and the festival has assembled a world-class cast, most of whom are on top form throughout. The two leading ladies, both Anjas, give the finest performances, Anja Harteros as Sieglinde and Anja Kampe as Brünnhilde. Harteros has a rich, sweet tone and excellent vocal support, which Thielemann exploits for his steady tempos and long lines. Kampe has a brighter sound, which is perfectly even, right up to the top. The musical highlight here is act III, scene 1, for the Brünnhilde/Sieglinde interactions, the two voices equally accomplished and both perfectly cast. Peter Sieffert is on his way down—but from what heights! He was 63 when this was filmed, and he still has all the vocal power of his younger years. But the tone is more husky and lacks bloom. There is also a wobble in the most taxing passages, like the act I finale. Even so, this is still an impressive performance, and one that few of his younger rivals could match. Georg Zeppenfeld is a reliable Wagner bass, but he seems miscast as Hunding. Maybe I’ve just seen him too often as Pogner, Marke, and Heinrich, but it is difficult to take him seriously as a bad guy. Nemirov has him groping Sieglinde to demonstrate his menace, but the aggression in his voice is more effective. Christa Mayer has an appropriately mature sound for Fricka, and plenty of character in her voice. She is a good balance to Kowaljow’s Wotan, whose voice is sufficient but not huge. All the words are there, and all the emotions, but he can’t compete with Kampe, who completely dominates the final scene. Thielemann delivers a typically excellent account of the score. His tempos are generally slow but always fluid, and skillfully communicated to the singers. One big difference from the Karajan days of the Salzburg Easter Festival is that the Berlin Philharmonic has decamped, now spending its Easters at Baden Baden. But given the beautifully idiomatic performance here from the Staatskapelle Dresden, few are likely to complain. The woodwind solos are particularly elegant, though every section of the orchestra excels. Given the huge stage, it is understandable that the camerawork is mostly close-ups, but, apart from a few arty slow zooms, the cameras are usually static, with unobtrusive editing. The surround sound on the Blu-ray is good, giving a sense of space and depth to both the stage and the pit. Subtitles are provided in German, English, French, Spanish, Italian, Korean, and Japanese, suggesting that C Major are reaching out to a wide audience with this release. It should find a receptive audience in all those regions, though more for its musical virtues than its recycled visual conception.